Showing results for tags 'whites mx sport'. 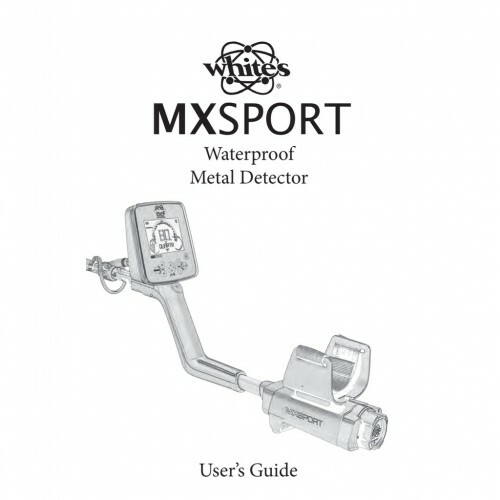 Mike Hillis spotted an ad for an apparently waterproof Whites MX - perhaps an MXT variant? NOTE ADDED 7/23/16 - this thread started before the MX Sport was released and is loaded with great information about the detector. However, once released problems developed. Please read the thread at http://www.detectorprospector.com/forum/topic/2307-new-archive-for-whites-mx-sport-threads/ for some of the latest information related to firmware and hardware problems with the MX Sport. Tips For MX Sport Relic Mode? I finally got to use my MX Sport today for the first time. In relics mode it was bouncing all over the place, switched to coin and jewelry and the machine performed better for me. Any advice for the relics mode would be appreciated. An error in VDI number and quarter/dime reporting has been noted in the early version of the new 6” concentric coil for the White’s MX series. I can’t imagine not digging anything reading in this range anyway, but it is something to be aware of. If nothing else it could affect resale value on the coils so if you have one and this is a problem it can be addressed under warranty once a fix is applied. Stay tuned. There are times when 6" is more than enough. I could take those jokes further but this is a family forum. https://www.whiteselectronics.com/product/mx-six-shooter-6-concentric-coil/ P.S. - Sorry this took so long Chuck. Been out of the office a lot lately. White's To Produce 5.3 (6") Concentric Coil For MX Sport? Speaking of the mx sport and coils, it looks like Whites is working on making a 5.3! There is a thread on another forum and tboykin is asking for testers. I would try an take him up on the offer only I don't know the first thing about being a tester and have my plate full with work for a couple weeks. I've tried the big coils before but usually find myself using the smaller ones 90% of myself. As soon as the 5.3 is ready for prime time I'll be picking one up! After trying an MX3 I decided I did not like it so I got rid of it and got an MX Sport...so far trying it in my yard and test garden....I am one happy camper (detectorist). Now to really learn this machine. MX Sport ... Problems ? Been thinking about picking up a 7" or 9.5" coil for the MXS. I've seen one review on YT on the 9.5 but nothing on the 7" They said the 9.5 looses very little depth over the stock 10" and pin points better. How much depth loss would the 7" have over the 10" and how well does the pin pointing work with the 7"? I've been detecting the fresh water lakes with a lot of trash and cant seem to hone in on my pin pointing. Thanks in advance. Sod.